(Reuters) - Shoppers like stay-at-home mom Susan Sterling are American retailers' worst nightmare this holiday season. The 52-year-old from Mountain Home, Idaho expects to spend only about $200 on holiday gifts, $100 less than last year, and plans to buy only what's on sale or clearance. She is not the only one cutting back. According to a new Reuters-Ipsos poll, most Americans plan to spend less than they did during the 2012 holiday shopping season. And by all indications, most are demanding rock-bottom prices. Retailers from Macy's Inc (NYS:M) to Wal-Mart Stores Inc (WMT) to Best Buy Co Inc (BBY) are responding with massive discounts even at the risk of profit margin declines. When the smoke clears on the unprecedented price-cutting blitz, consumers should emerge as the clear winners. "It's going to be a promotional frenzy this year," said David Bassuk, a managing director at advisory firm AlixPartners and co-leader of its retail practice, which expects overall holiday sales to rise 4.1 percent to 4.9 percent - higher than the National Retail Federation's forecast for a 3.9 percent rise and last year's 3.5 percent increase. Underlining Bassuk's point, Wal-Mart said on Tuesday it would jump the gun on special prices offered by its competitors on Black Friday, the day after Thanksgiving and the traditional start of holiday shopping period. Wal-Mart will match Black Friday offers on toys and electronics from Target Corp (TGT.N), Toys R Us and Best Buy starting as early as a week before the big shopping day, which falls on November 29 this year. The world's largest retailer will sell television sets at the lowest prices "in several years," said Laura Phillips, senior vice president for entertainment at Walmart U.S. It's the first year the retailer is including electronics in its pre-Black Friday sales. Rising the challenge, Best Buy vowed on Tuesday to do whatever it takes to compete, even if it hurts fourth-quarter margins. Chief Executive Hubert Joly said in an interview the retailer was "playing to win" and did not want "price to be an obstacle." He declined to estimate the potential impact on margins. To be sure, the emphasis on discounting is nothing new. Since the recession, Americans have searched for ways to save money. They're disconnecting home phones, opting for free entertainment and driving cars longer before replacing them. Beyond that, the Internet has made it easier to find deals. "In general, Americans are learning to live without some things," said Ted Vaughn, a partner at consulting firm BDO, whose survey of 100 retail chief marketing officers predicted that sales in established stores during the holiday season would rise 2.5 percent for 2013. "At certain points in history you have a resetting of expectations," said Vaughn. "This one is proving to be very significant." 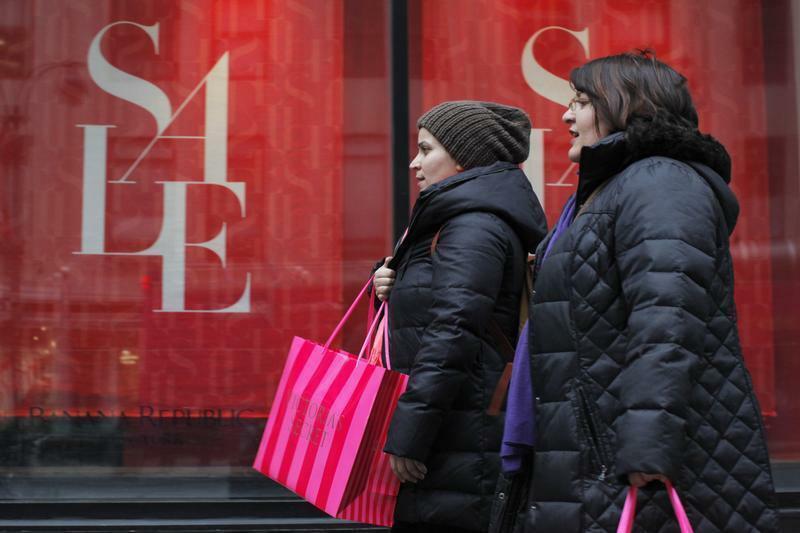 That's affecting how much Americans plan to spend on the holidays, even big spenders. According to the Ipsos poll, 61 percent of shoppers plan to spend less than $500 in 2013 compared with 57 percent in 2012, and 18 percent plan to spend between $500 and $1,000 compared with 22 percent in 2012. Slightly fewer shoppers plan to spend more than $1,000 than last year. About a third of those surveyed plan to buy fewer toys, clothes and electronics. Only 14 percent plan to spend more on electronics and 13 percent see spending more on toys and clothes. Jewelry sales may slip the most. Almost 40 percent of shoppers expect to spend less this year on and only 3 percent more than 2012. "Because of the way the economy is, everyone is looking for a bargain," said Andrea Smith, a 41-year-old Columbus, Ohio, bookkeeper, who plans to buy her daughter a new sewing machine and her son a camera but she expects to spend about $400, half of what she did last year by making many of her gifts. BDO's Vaughn expects shoppers to delay purchases even with the discounting, waiting as long as they can for deeper price cuts. About half of shoppers haven't started shopping, 27 percent completed less than a quarter of their purchases and 5 percent have finished shopping, according to the poll. To be sure, not every shopper is feeling the pinch equally. More affluent Americans, buoyed by stock market gains of over 20 percent this year and higher home prices, appear to be more willing to spend this holiday season - good news for retailers. People who earn $70,000 and up account for 33 percent of U.S. households, but 45 percent of spending. People who bring home less than $30,000 per year also account for a third of households, but they are only responsible for about 19 percent of spending, according to U.S. Census data crunched by AlixPartners. Still, even the well-off are insisting on bargain prices. "The good news is that upper-income consumers are feeling really good and they're going to spend even more," said Bassuk. "The bad news is that they're still going to be very value driven ... they still want great deals," he said. Discounts appear to be helping Macy's Inc (NYS:M), which owns its namesake department stores as well as Bloomingdale's, a more upscale chain. The company reported stronger-than-expected third-quarter sales last week, helped in part by more intense advertising of its lowest priced merchandise. Likewise, "off-price" retailer TJX Cos Inc (TJX.N), owner of T.J. Maxx and Marshalls, reported on Tuesday a stronger-than-expected adjusted profit and said the holiday shopping quarter is off to a strong start. Despite the aggressive pricing, Wal-Mart expects to tread water. It forecast U.S. sales in established stores for the fourth-quarter would show little change from last year. The giant retailer is betting heavily on discounted electronics. The chain bought 65 percent more televisions and twice as many tablets for its Black Friday sales this year than last to entice shoppers into the stores. "Electronics do drive traffic, there's no doubt about it," said Steve Bratspies, executive vice president of general merchandise for Walmart U.S. "It's by far the biggest category during Black Friday. So you have to win in electronics." Janney Capital Markets analyst David Strasser called the level of promotion at Wal-Mart "unprecedented" and said it could come at the cost of a deeper-than-expected slide in gross margins. Ronald Goodstein, an associate professor of marketing at Georgetown University's McDonough School of Business, thinks all the discounting will take a big toll on this year's holiday revenues, which he says will fall short of last year's totals when taking inflation into account. Still, retailers have little choice after getting consumers accustomed to never paying full price by constantly topping one another with discounts and promotions, he said. "We're creating a retail market where everything is going to be on sale all the time," he said. "You're killing yourself as an industry, you've trained people to only buy on sale."